Two is better than one! This common phrase definitely applies when it comes to using twin ropes. Twin ropes are only used in double strands and are used for both your ascent and descent. With a diameter of between 7 and 8 millimeters, twin ropes are very thin and can therefore never be used individually for climbing. Their double stranded nature makes twin ropes very secure for climbing. Twin ropes are always hung together into the intermediate connection points. It is highly unlikely that both ropes would be severed on a sharp rock, falling rocks or due to too much pressure at exactly the same time. There is also the possibility of abseiling down the full length of the rope. 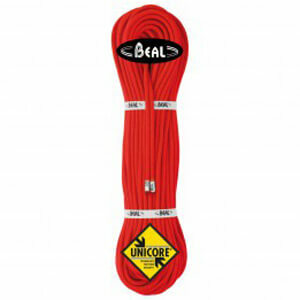 Twin ropes are mainly used for Alpine climbing. What do twin ropes need to do? Because your life hangs in the balance of these twin ropes in the truest sense of the word, they should be of the highest quality and very reliable. To do this, twin ropes are tested according to the European safety standard EN 892. In this standard drop test, the twin ropes must withstand 12 drops with an 80 kg load without tearing. The rope may also stretch no more than 40 percent in the case of a fall and 10 percent under the normal load. Twin ropes can only be placed on the market as climbing ropes if they make it through the test. This ensures the highest safety levels for each climbing rope. Another thing to look out for when purchasing twin ropes is that they are DWR treated. This is especially important in Alpine climbing. The dry treatment prevents any moisture from penetrating the climbing rope and protects it against dirt. This significantly extends the lifespan of the twin ropes.